Caelinn Leahy and Splendor share the winner's circle with Steve Schaefer as they accept the top prize in the $50,000 HITS Grand Prix. 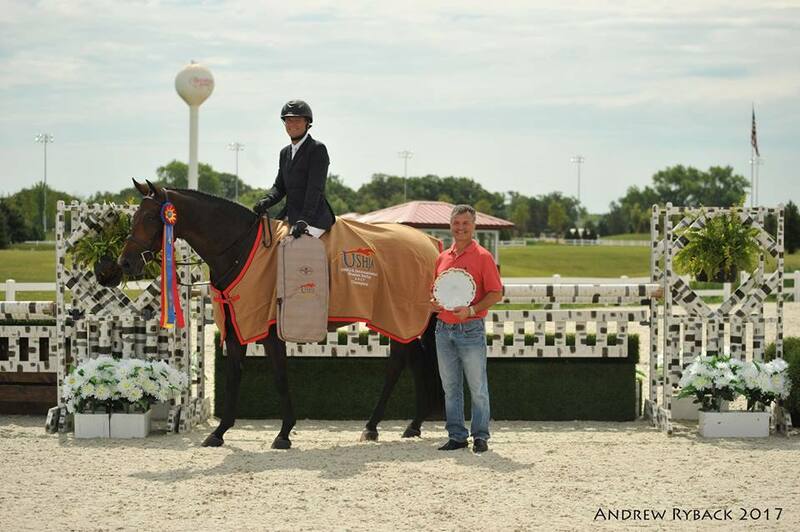 Crete, IL – July 22, 2017 – Bellis Show Jumping of Maple Park, Illinois, took two trips to the winner’s circle for major wins in both the hunter and jumper rings at the Showplace Summertime Show at HITS Balmoral Park. 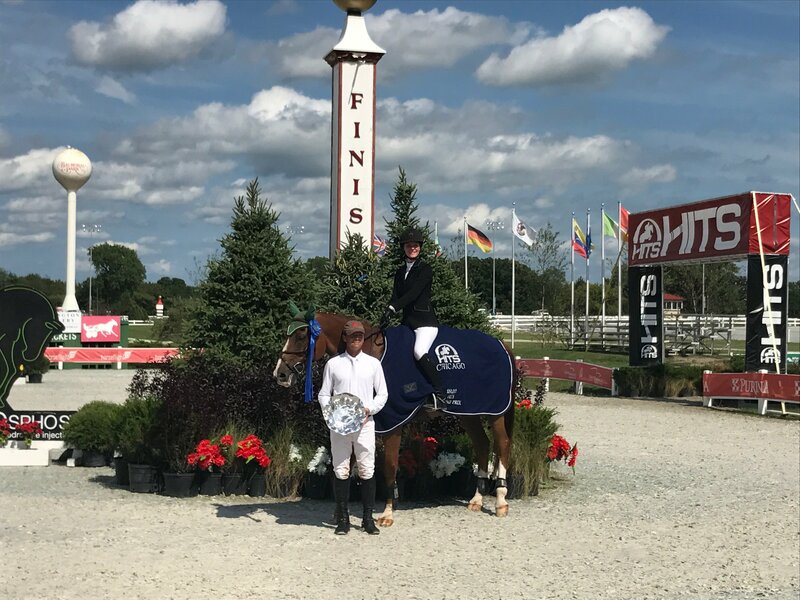 Trainer Steve Schaefer took Color Pearlz into the winner’s circle for their win in the $10,000 USHJA International Hunter Derby and Caelinn Leahy showed how Chicago riders dash for cash, taking her trip to the winner’s circle on Splendor in the $50,000 HITS Grand Prix. 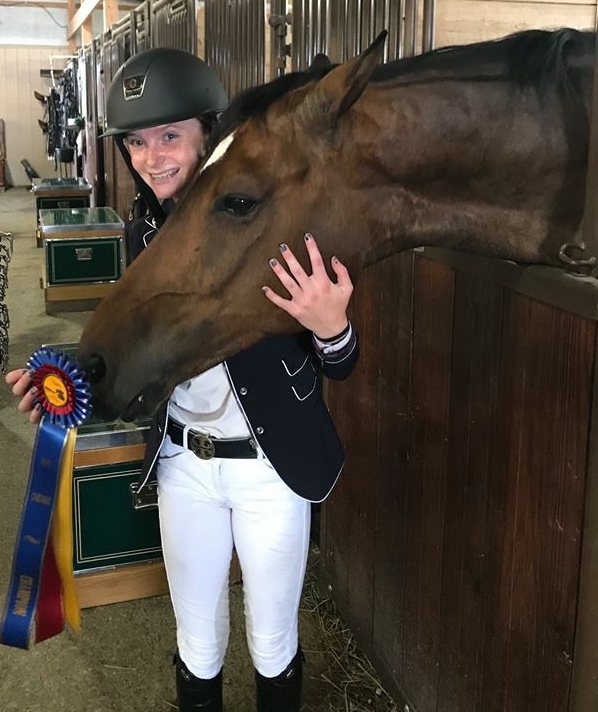 Leahy, 15, started riding Splendor in May at Balmoral and won some classes in the 1.30 and 1.35 divisions. This was her second grand prix win to date and her first $50,000 win. The pair galloped to the finish line in 38.875 seconds to be two seconds faster than the rest of the jump off field of 6 for the win. Leahy has learned her jump off skills from Schaefer, known for his ability to be fast in the jump offs. Caelinn Leahy and Splendor. Photo Chicago Equestrian. Their plan earned them the big paycheck. Leahy adores Splendor and she and Schaefer have him on a “less is more” program. Splendor at age 18, spends a lot of time trail riding and fox hunting between shows. Splendor will head back to the fields until his next big show ring event, which will most likely be Equifest in Elgin. 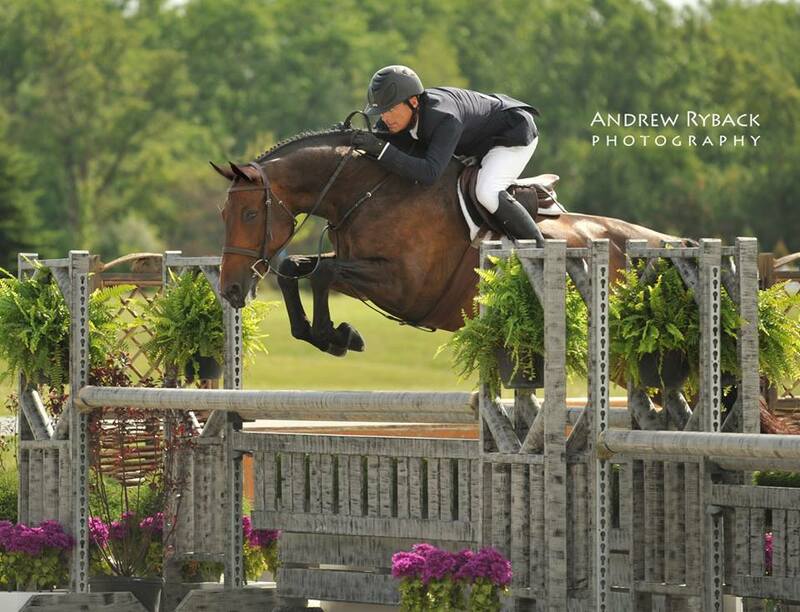 Color Pearlz and Steve Schaefer in the $10,000 USHJA International Hunter Derby. In the main hunter ring, Schaefer was in the limelight with Matt Yeterian’s Color Pearlz as the earned the top prize in the $10,000 USHJA International Hunter Derby. Once again, it was Schaefer’s second round skills in the handy that took him to the top of the leader board since the pair stood in fifth place after the classic round. Owner Matt Yeterian in the winner's circle with Color Pearlz and Steve Schaefer aboard. The 8 yr old Zangersheide mare also does the Green Hunters 3’9” with Schaefer and the Amateur Owner Hunters 3’3” with Holly Yeterian, Barrington Hills, Illinois. The attractive mare took a break after the Winter Equestrian Festival so they could harvest some embryos, making this the first time she was back in the ring since Florida. They plan to continue to show Color Pearlz in the derbies and Holly Yeterian will work on moving up to the 3’6” Amateur Owners. In addition, Bellis team member Lindsay Scianna and Rockefeller earned the Puddle Jumper Championship and was tied for Reserve Champion with Fahris. 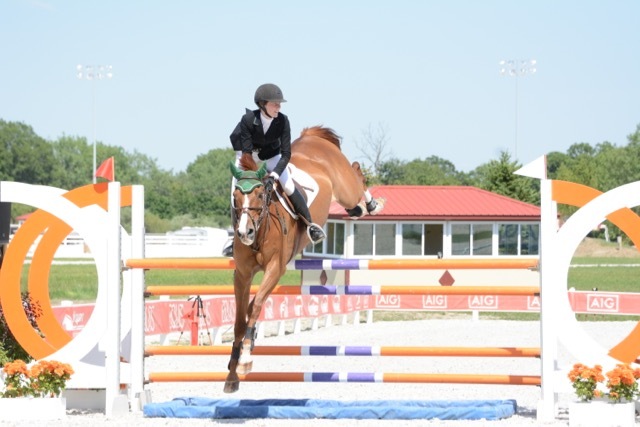 Bellis Show Jumping will head to Equifest in Elgin, Illinois next as they continue their show season. 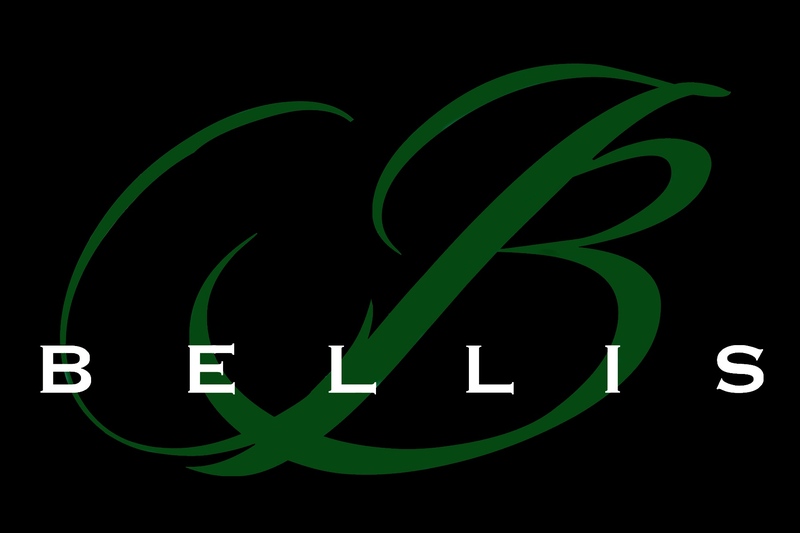 For more information on Bellis Show Jumping and their services, please visit their website at Bellisshowjumping.com or follow them on Facebook.